These types of appliances include spring retainers and palatal expanders. Spring retainers are removable and easy to use, and can be worn on upper and/or lower teeth to get them aligned. This type of appliance can be used for less complicated teeth alignment cases and requires monthly adjustments. 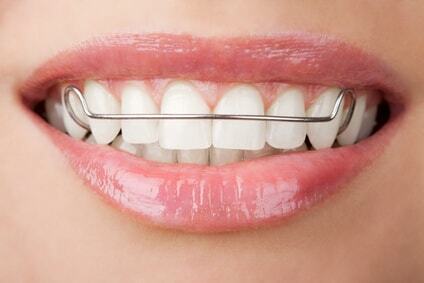 The length of orthodontic treatment is usually a short period of time. The more hours the appliance is worn, the more efficient movement and straightening of teeth. The Palatal Expander is a fixed appliance that is placed on the upper jaw. It functions to expand the upper arch or roof of the mouth. There are several reasons to widen the upper arch. First, by widening the upper arch, there can be an improvement in the way upper teeth line up with the lower teeth, giving the patient a better bite. Second, where a high palate and narrow arch restrict the breathing passages located above, widening the palate widens the air passages. Then the patient can breathe more easily through his nose. Third, widening the palate can make more room for crowded teeth to align better. The expanding action of the appliance gently separates the elastic membrane in the center of the palate. Once the palate has been expanded fully, bone tissue fills that space. The upper arch is usually expanded in 4-6 weeks. However, the appliance is allowed to remain in the mouth for a longer period, while new bone is generating in the expanded arch. You will notice that widening of the palate also temporarily causes space between the two front teeth. Do not be alarmed, the space closes again naturally. Dr. Magoulas recommends Tylenol, Motrin, or Advil for any discomfort. The palatal expander is shaped like a butterfly; this design makes it more comfortable, it guarantees jaw movement, and is easy to clean. It’s use results in a healthier bite and provides more room for adult teeth to come in.